The use of molecular techniques has shown that hybridization and introgression have significant impacts in evolution, by means of transfer of genetic variation and formation of hybrid species. In this paper we use mitochondrial and nuclear sequence data to investigate the evolutionary history, levels of genetic diversity and population differentiation of a rare and endangered fish species. Our results suggest that a hybrid origin scenario of Chondrostoma olisiponensis is a likely explanation for the shared genetic and morphological traits with Iberochondrostoma and Achondrostoma + Pseudochondrostoma. The basal positioning of C. olisiponensis alleles in all loci analyzed indicates that hybridization events occurred before differentiation within each of these groups, most likely during Middle–Late Miocene. Originally described as C. olisiponensis, we suggest that this species should be placed in the genus Iberochondrostoma to avoid confusion with ‘real’ central European Chondrostoma and to (partially) reflect its evolutionary history. Analyses of levels of genetic diversity and patterns of population subdivision show that populations of the rare Iberochondrostoma olisiponensis are differentiated (high and significant φST and F ST) and genetically depauperate (very low S, π, and θ). I. olisiponensis is simultaneously imperiled by small population sizes and contemporary bidirectional hybridization with another critically endangered sympatric species (Iberochondrostoma lusitanicum). 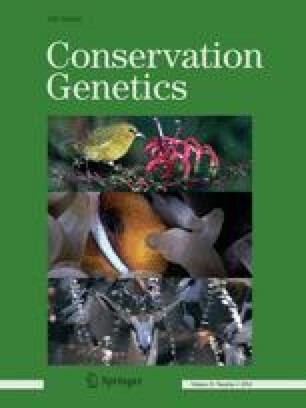 Urgent ex-situ conservation measures involving supportive breeding of I. olisiponensis are needed to preserve present genetic variation and eventually increase in situ population sizes, along with further studies focused on different life history and behavioral characteristics of this highly endangered species. C. Sousa-Santos and H. F. Gante contributed equally to this work. The online version of this article (doi: 10.1007/s10592-014-0568-1) contains supplementary material, which is available to authorized users. Professor Vítor Almada passed away during the manuscript revision process of this paper. He was the coordinator of the UIEE-ISPA and he devoted much of his work to the preservation of native freshwater fish species in Portugal. CS-S and JR will be forever grateful for his guidance. We thank Ignacio Doadrio (MNCN-CSIC, Madrid, Spain) and Jöerg Freyhof (IGB, Berlin, Germany) for providing samples for genetic analyses. We also thank G. Lemos, C. Lima, P. Coelho and F. Ronenberg for their help during sampling, and M. Drago for help in the lab. The AFN and ICNB Portuguese agencies provided the necessary permits for fielwork. This study was financed by the European Fund for Economic and Regional Development (FEDER) through the Program Operational Factors of Competitiveness (COMPETE) and National Funds through the FCT—Portuguese Foundation of Science and Technology, under the Pluriannual Program UI&D 331/94 and 329/2011, and the projects PTDC/AAC-CLI/103110/2008 and PTDC/BIA-BDE/66519/2006. C. Sousa-Santos was supported by a Post-doctoral grant from FCT (SFRH/BPD/29774/2006).